This was a fun card to make and my sister put them in her son's stockings and they just loved them! They even said they were going to keep the cards because "Aunt Shirley made it". Jeannie Phillips was the creator of the card and I stole the idea from her. 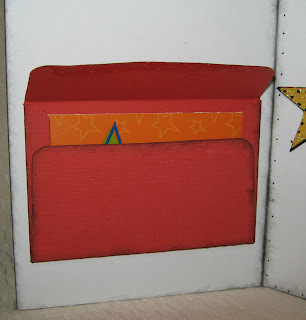 Jeannie is fabulously talented but sadly she isn't making cards anymore. For some odd reason she got hooked on the Knifty Knitter and is now knitting to her hearts content. She even recently got a spinning wheel! If you would like to see some of Jeannie's great work you can go to A PLACE FOR MY CARDS and see what she has been up to lately. I so totally swiped this idea from Jeannie Phillips on the Cricut messageboard! She is one talented lady, let me tell you! If you have a minute go over and check out her work on her blog at A Place For My Cards or you can also check her out at Win a Handcrafted Card and see if you can't win one of her fabulous creations! When I saw Jeannie's card I fell in love with it and knew I wanted to make some. My sister gives her (grown) sons movie gift cards in their Christmas stockings each year and I thought this card would be great for her to put the gift cards in. I sent Jeannie a message and asked if she minded if I posted a .cut file to the 4 STAR MOVIE CARD on my blog. Being the gracious person she is, she said she didn't mind at all! I used Plantin for most of the cuts, however I did use Locker Talk for the ticket. If you want to use the file you can just delete the images of the ticket. The file is set to cut 4 at a time. I also just used my trimmer to cut the silver for the back of the film strip. I used a background stamp for the popcorn bucket and then colored in between some of the lines with a Stampin Up marker. 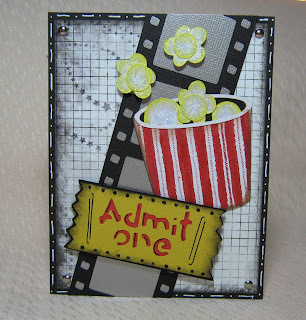 I used cat eye ink to do the shading on the bucket, ticket and popcorn. The mats are all labeled for you. There are some extra circles that will cut to help you fill in the popcorn bucket, but you might have to punch or cut a few extra also. 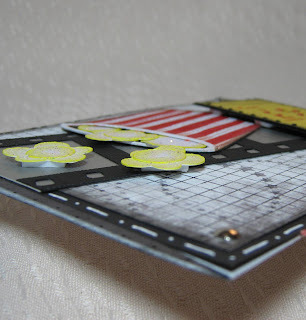 I pop dotted the popcorn and ticket for some added dimension *okie so loves dimension on cards...and layouts...and is glad we live in a 3 dimensional world*. I didn't glue the bucket all the way down so I could slide some "popcorn" in the bucket. I added some stickles to the popcorn just because I thought it might look good and I LOVE STICKLES! Anyone else out there love Stickles? Can I get a HELL YEAH! *okie cracks up laughing at herself knowing that people are rolling their eyes and thinking 'that dang okie ain't got no kinda sense'*. I did use the white Signo pen to do the doodling around the edge of the card. The saying is generic so it can be used for various occasions. Also the sentiment is completely in one piece so if you want to r esize it you can. Just don't forget to resize the stars that go on top also. 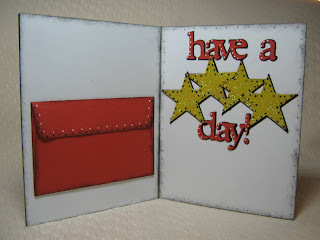 I used Doodlebug sugar glitter on the stars and then dotted with black diamond Stickles. I also doodled with the white Signo pen on the letters. The inside envie will hold a gift card. N o that is not a movie gift card, it is my Staples Teacher Rewards card! I had to make sure it was the right size and that is the card I pulled out of my purse to use as an example. But it does fit rather nicely with the stars on there now doesn't it. I used some Aileens Tack It Over and Over on the flap of the envie so it will stay close but yet be able to reopen. We are heading to Grand Turks today and our plans are to spend some time on the gorgeous beach! I told my BFF Karen that we should order room service before heading to the beach so we can take a picnic lunch. She said something about a bucket of beer so I am not sure we are going to eat today *okie is thinking she should have packed some snacks to sneak on the ship*. I love, love, love this card. What a great way to give a movie pass. Thank you so much for this post. I want to let you know that I posted a link to your blog in Creative Busy Hands Cricut Freebies Search List, under the Alpha(s),Word Art(s), Word Book(s) post on Mar. 02, 2011. Thanks again.